From Monday, February 1 through Tuesday, February 9, guests are invited to enjoy Mardi Gras-themed cocktails in the Round Robin Bar at the Willard InterContinental. 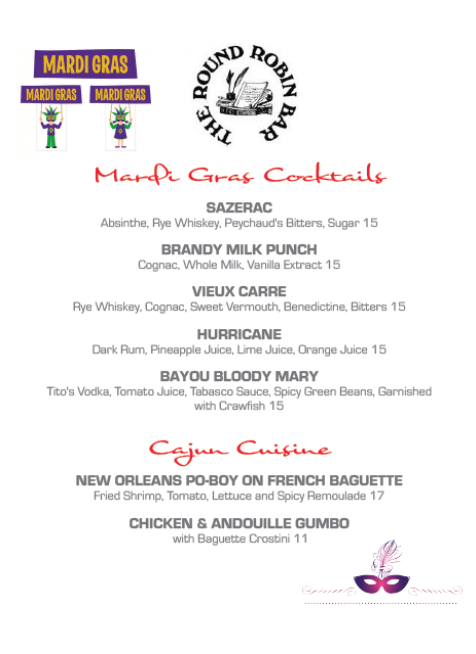 Choose from specialty cocktails such as the Vieux Carre with rye whiskey, cognac, sweet vermouth, Benedictine, and bitters, the Brandy Milk Punch with cognac and vanilla extract, and the Bayou Bloody Mary with Tito’s vodka, tabasco sauce, and spicy green beans garnished with crawfish. Favorites like the Hurricane and Sazerac will also be available. 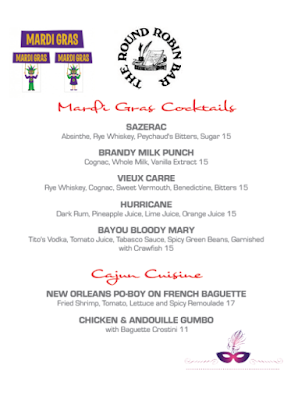 Fans of Cajun cuisine can order the New Orleans po-boy on a French baguette and chicken & andouille gumbo.